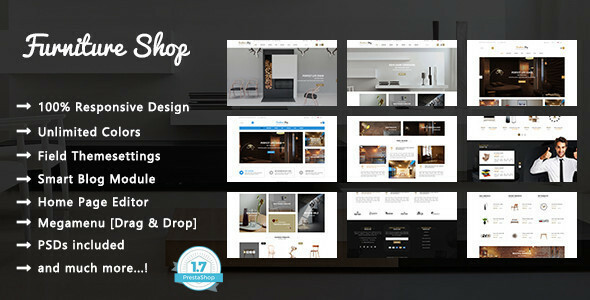 Furniture Shop is a beautiful Furniture Responsive Prestashop 1.7 Theme with a modern color and refined style in design could increase your product’s values and increase sales by showing off your furniture products in living room, bed room, office. Customers might feel they have a wonderful, perfect comfortable life. Home page is designed eye-catching with large slideshows above and below Mega Menu. Slideshow is great with smooth transitions of texts and nice images. Besides, Furniture Shop Theme is designed with a modern and new style and new web technologies: Font Awesome 4, W3C, CSS3, HTML5 helping customers to display products professionally.